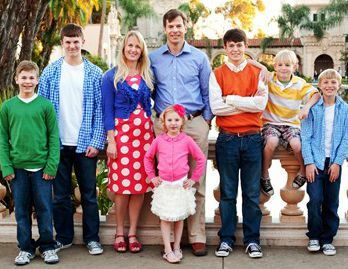 After five sons, Michelle gave birth to daughter, Mary, now age 10. A Brighton fan, she encourages all her kids to live, love, laugh and dream. Michelle married Erik just before graduating as valedictorian from BYU. She has devoted herself to creating a big, happy family. Michelle learned photography to take good pictures of her kids. She now also works as a professional photographer with a distinct, pretty style. Play Unplugged encourages kids to step away from their electronic screens. Michelle is helping to bring the program to Salt Lake City this summer. 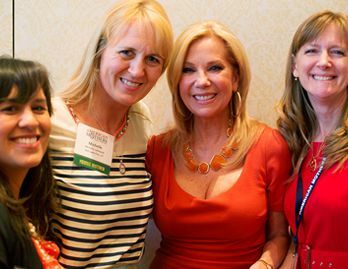 Kathie Lee Gifford joins Michelle and Young Mothers from other states at the AMI convention last year. The annual event honors motherhood. 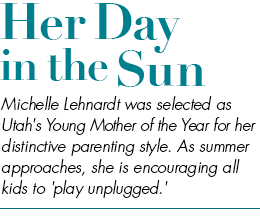 Last spring, Michelle Lehnardt is having breakfast with her kids, talking about their summer plans. They kick around fun ideas for activities that don’t involve electronics like TVs, computers or phones. As they brainstorm, she flips through the local paper and sees an article on Play Unplugged, a summer program launching in nearby Heber City, Utah. Struck by the coincidence, she picks up the phone and starts dialing. Erik Rowland is on his way to a meeting. A software entrepreneur, devoted dad and concerned citizen, he is spearheading Play Unplugged as a member of the Heber City Council. After the Sandy Hook tragedy, he wanted to do something proactive to reduce violence. Since kids are exposed to so much violence through video games and media, he is trying to encourage them to spend less time looking at screens. At the moment, however, he is staring at a screen, as his cell phone indicates an incoming call from an unfamiliar number. Michelle introduces herself and explains that she wants to bring Play Unplugged to her community in Salt Lake City. 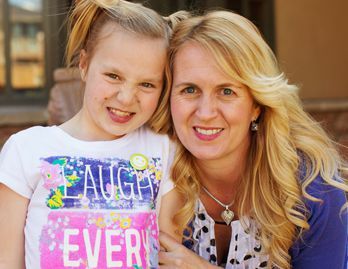 As Utah’s 2013 Young Mother of the Year, she is looking for a year-long project that can benefit local families. As she speaks about receiving her title from American Mothers, Inc., Michelle looks around her home, aware that she might not seem like an obvious choice for it. Her pantry is a mess, with cereal and bananas sometimes standing in for dinner. She doesn’t mind much when her kids leave their beds unmade or procrastinate on chores. In turn, she seldom volunteers at their schools. Fortunately, the AMI selection committee sees greater value in other aspects of her motherhood. Michelle appears to focus entirely on happiness. She devotes her time and energy to promoting kindness, having fun and giving hugs. Since the outside world can be a tough place, she ensures that her kids feel nothing but love at home. It’s a place filled with light. Her son, Stefan, wasn't home for his 20th birthday, but Michelle threw a party for him anyway. At BYU, she majors in history and has ambitions to be a writer. Then during a semester at BYU Hawaii, she sees fellow student Erik Lehnardt singing in church. They had gone to the same high school, but never met. “That’s the kind of man I’d like to marry,” she thinks to herself as he walks off. He finally notices Michelle during Halloween, probably as she throws pumpkins off a roof – one of her favorite activities during that holiday. Six months later, before graduating as BYU valedictorian, Michelle marries Erik and is soon expecting their first child. Birthday videos have become a bit of a tradition. Michelle made this one for her son, Ben, last year. Wanting to be the best possible parent, she seeks advice from other mothers and develops her own approach. She has consciously created the family life she wishes she had and maintains her youthful sense of fun. Her kids laugh with her as she dances in the kitchen, drives through puddles to make a big splash and go doorbell ditching on Valentine’s Day. Erik also likes to have fun. "My life would be so boring if my parents weren't so immature," their son, Gabriel, 12, likes to say. Since few pictures were taken of her growing up, she shoots plenty of photos of her own kids. In fact, she learns to be a terrific photographer and loves capturing people in pretty, joyous, active moments. Most notably, she often shoots into the light for its infinitely fascinating effects. 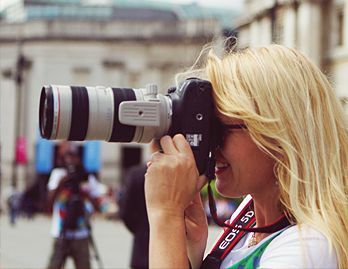 Besides sharing images through her blog, she now also works as a professional photographer. She also practices what Ruth calls “preventive parenting,” steering away from situations that would lead to conflict. For instance, Michelle needn’t nag about cell phone use since her kids don’t get mobile devices until they’re 15. That approach includes drawing kids toward positive activities. Back in Michelle’s kitchen, as she continues her conversation with Erik Rowland, he can sense that her positive approach coincides well with his. Instead of telling kids to stop playing video games, Play Unplugged simply offers fun alternatives, so their lives can be more balanced. As a father of three, he’s confident that kids don’t need elaborate, planned activities to be engaged. 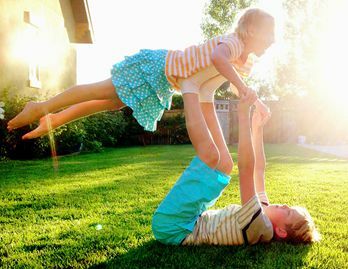 They have a natural ability to amuse themselves -- to play. He’s proven correct when the Heber City program becomes a big success in the summer of 2013. After many phone calls, emails and meetings, Michelle and Erik are able to interest the Salt Lake County mayor’s office and Granite School District to participate. It promises to be the largest one of the nine programs running this summer, open to 61,000 kids. Michelle is working to get 160 businesses to sponsor activities by the end of April. Then on the last day of school, Granite kids receive a lanyard and a magazine featuring unplugged activities. After completing one, the kids visit that activity’s sponsoring business to receive a "brag badge" for their lanyards. Michelle’s son, Xander, 15, intends to collect every badge this summer. No doubt Michelle will capture every remarkable moment, with her heart and camera turned to the light. As her promotion of positive change extends from her family to her community, she’s having her day in the sun.